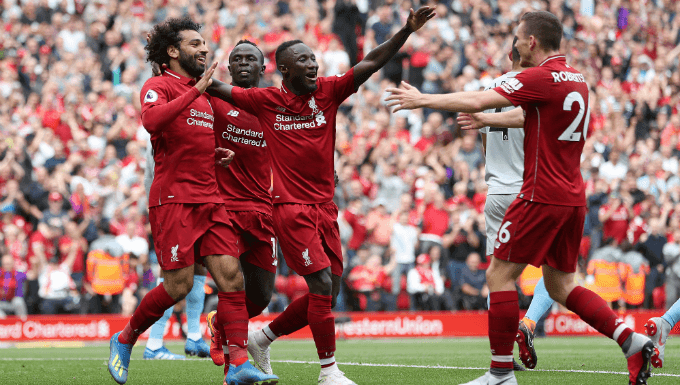 Liverpool delivered the most impressive performance of the Premier League’s opening weekend with a 4-0 vanquishing of West Ham, but they must now build on that triumph with another against Crystal Palace on Monday evening – a scheduling decision which will bring back bad memories for all those who follow the Reds. It was on the same night of the week that Liverpool’s last Premier League title tilt was in effect ended, back in May 2014. Brendan Rodgers’ men needed all three points to keep in touch with Manchester City at the top of the table, and they duly stormed into a 3-0 lead, against a Palace side who had already made sure of their survival. Yet Tony Pulis’ men delivered an astonishing comeback in the closing stages, scoring three times in the final 11 minutes to dash Liverpool’s dreams. It was, in truth, a 2-0 home defeat by Chelsea the previous week which truly cost the Merseysiders their first championship crown in the Premier League era, and it is also worth noting that their record at Selhurst Park in subsequent seasons has been pretty good: Liverpool have won four of their last five visits to this ground, a 3-1 loss to Neil Warnock’s charges in 2014/15 representing the only blip. Crystal Palace are a good side, but it is worth backing Jurgen Klopp’s team to make it five wins from their last six trips to this corner of south London on Monday. Liverpool were excellent in their dismantling of West Ham last time out, playing fast, attacking football and creating chances at will, so it’s no surprise to see them odds-on to win again with all the top football betting sites. Pleasingly for Klopp, they also recorded their first clean sheet of the campaign at the first possible opportunity, which stands in stark contrast to their 3-3 draw with Watford on day one in 2017/18. Naby Keita turned in an accomplished debut performance in the heart of midfield and goalkeeper Alisson, although largely untested, will have been delighted to come through his maiden appearance without conceding. With Fabinho and Xherdan Shaqiri also moving to Anfield in the summer, it could be argued that no team in the Premier League enjoyed a better transfer window than Liverpool. It is early days, of course, but the reason the Reds’ recruitment has been praised is because all four newcomers solve problems which prevented them from challenging for the title last term: Alisson is a clear upgrade on Loris Karius, Keita offers a fine blend of dynamism and creativity in the centre, Fabinho is a superior player to Jordan Henderson, and Shaqiri provides cover for the much vaunted front three of Roberto Firmino, Mohamed Salah and Sadio Mane. Given that Liverpool looked a great deal more secure at the back following Virgil van Dijk’s arrival in January, there is every reason to believe the team is sufficiently equipped to battle Manchester City for the major domestic honour. Monday’s match will be a test of their credentials, though. Crystal Palace ended last season brilliantly, winning four and drawing two of their final six games to pull clear of relegation trouble and into mid-table. They then picked up from where they left off in 2017/18 on the opening weekend, easing to an impressive 2-0 win at Fulham thanks to goals from Jeff Schlupp and Wilfried Zaha. The Eagles have been boosted by news that star man Zaha has put pen to paper on a new five-year deal, and they will need the Ivory Coast international to be at the top of his game if they are to cause an upset under the lights at Selhurst. Palace have produced some excellent football at times under Roy Hodgson, often taking the game to the opposition and playing on the front foot. They do, however, retain the counter-attacking prowess, which has underpinned their approach ever since Dougie Freedman took charge back in 2011, and they will look to play on the break against Liverpool here. Palace have now failed to score in only two of their last 18 league outings, so we can expect them to find the net at least once when they lock horns with Klopp’s men. Liverpool have plenty of firepower of their own, of course, and that should be enough for them to make it six points from six heading into next weekend’s clash with Brighton. It would therefore be wise to back an away win with both teams to score at 19/10 with 888sport, a bet which would have paid out in each of the Reds’ last four trips to Selhurst Park in all competitions.